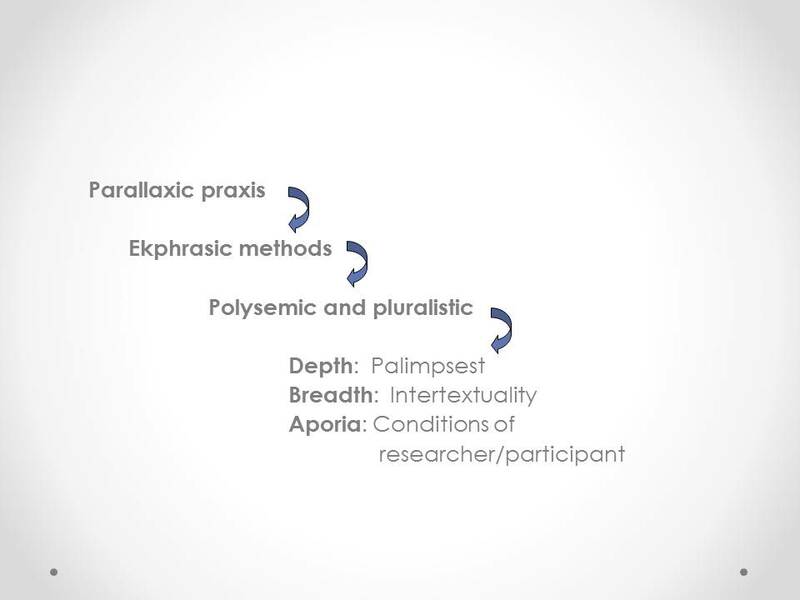 In this project, researchers Pauline Sameshima and Patricia Maarhuis use polysemy (constructed signs with many meanings) performed through ekphrasic interpretations (translating transcripts into an art form) within a Parallaxic Praxis model (an interdisciplinary dialogic and constructive model). Our intention is to critically reflect upon our ekphrasic metaphors to examine their semantic fields and thus gain broader understanding. Arts-informed interpretation and analysis was conducted by the two researchers, who worked from the same transcripts in an independent and separate manner throughout the analysis and interpretive process. Two arts-informed interpretations based on Gilda's transcripts. Ekphrasis, from the Greek meaning to draw out or to make clear and has been traditionally defined as the use of verbal representation (i.e. poetry) of a visual representation (i.e. painting or sculpture) (Mitchell, 1994). For this project we adopted a broader definition of ekphrasis in that any medium of representation can be used to represent another. For example, one form of representation – narrative texts that describe the experiences of women in recovery from meth addiction - is (re)interpreted into multiple representations through sculpture, poetry, and photography to engage in “active transformations” of meaning, which advances its “polysemic values” by having many connotative meanings or cultural significations (Hall, 2007, p. 483).